A complete guide to the 11 best rooftop bars in Athens in 2019. In between Acropolis and Syntagma Sqaure you should take a well deserved rest and visit some of the best Athens rooftop bars. And you can find the best places to take in this wide sprawling city right here, with the ultimate guide to the best terraces located here. For starters: Which are the best rooftops in Athens? Below you’ll find all the info you need about each rooftop. Opening hours, dress code, pictures, maps and much more. So, which is the best rooftop bar in Athens? Here's a complete guide to the best places. 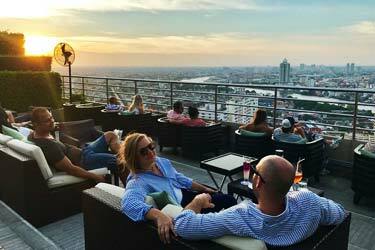 Just scroll down and find the Athens rooftop bar best suited for you. Or use the Athens rooftop map in the bottom right corner. Right in the heart of Athens you will find this fine dining oasis, located on the 7th floor of the King George II Palace Hotel. 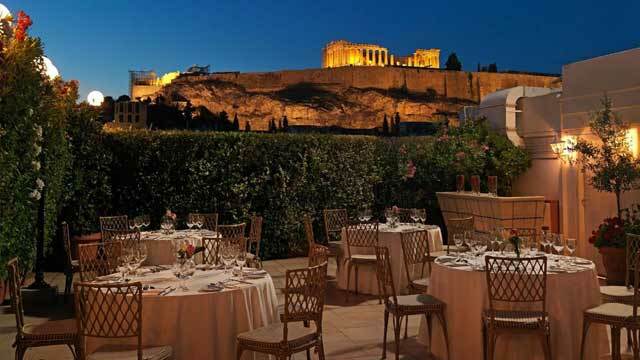 From the rooftop restaurant you get a fantastic view of the historical sites of Athens, like the Acropolis. Serving modern cusine with inspiration from the classic Greek kitchen, the restaurant has been selected amongst the best ones in Greece five years in a row. So expect tastes of the very highest class, along with well made signature cocktails and an impressive wine list. 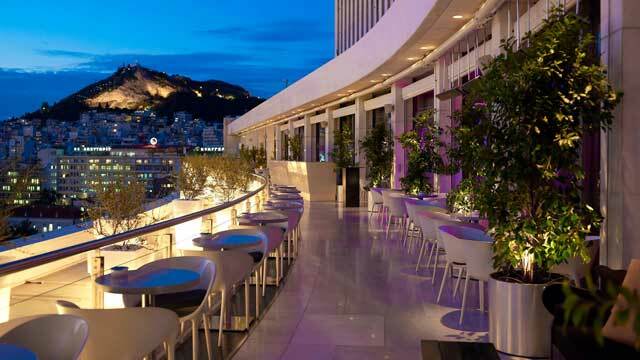 Sophisticated and cool rooftop restaurant and bar, located on top of Hilton Athens. From the open-air terrace you can enjoy stunning views of the ancient Acropolis and and Lycabettus Hill along with (what feels like) the complete Athens skyline. Upscale in style and decor but laid back in vibe, here you can enjoy Mediterranean cuisine from the dinner menu and a bar menu offering both sushi and bites, along with delicious signature cocktails and a wide selection of wines. On top of the AthenStyle hostel, right by Monastiraki Square, you find this lovely and easy-going rooftop bar and restaurant. A bit of a hidden gem, offering spectacular 360-degree view of downtown Athens with the Acropolis as a powerful background. Not as fancy as alot of other rooftops in decor, but instead a very relaxing spot offering great food and drinks to very human prices. Open from early morning to late at night, the rooftop bar serves traditional Greek food along with classic cocktails, coffee drinks and ice cold beers. 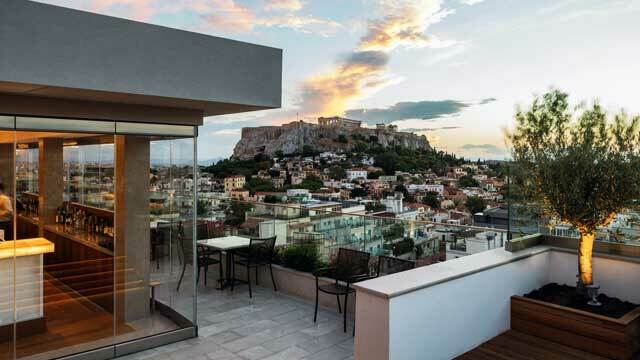 Perched on the 9th floor, right in the heart of the city, this seasonal rooftop terrace offers a spectacular view to the Acropolis and Lycabettus Hill. Equipped with a lovely rooftop pool, during daytime the terrace is pool bar and lounge for guests staying at the hotel. 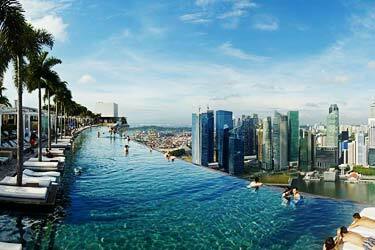 Swim in the 22m pool or relax in the jacuzzi, while sipping on a refreshing beverage from the rooftop bar. At night the stylish and contemporary Sky Lounge opens to all. Relaxing in vibe, here you can enjoy creative Greek cuisine, cocktails and a large selection of local wines. 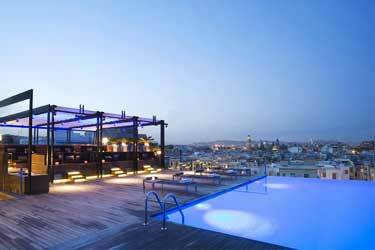 A modern and stylish rooftop terrace with a rooftop swimming pool, a great restaurant and a cool bar. Perched on the 9th floor of the chic Hotel Fresh, close to Monastiraki, the restaurant and rooftop bar serve healthy and classic Mediterranean cuisine and a large selection of signature and vintage cocktails along with an impressive wine list. Both inside lounge and open-air terrace, Air Lounge is open all day and late into the night, offering dining and lounge seating along with friendly vibes and panoramic views. Perched on the 21st floor of the President Hotel Athens, this is the highest hotel rooftop bar in Athens (and all of Greece). Located in the heart of the city, close to Panormou Station, the terrace comes with a breathtaking 360-view over all of Athens. Up here you find a luxurious and large rooftop pool, comfortable sun beds, lounge sofas, dining tables and even an indoor terrace. 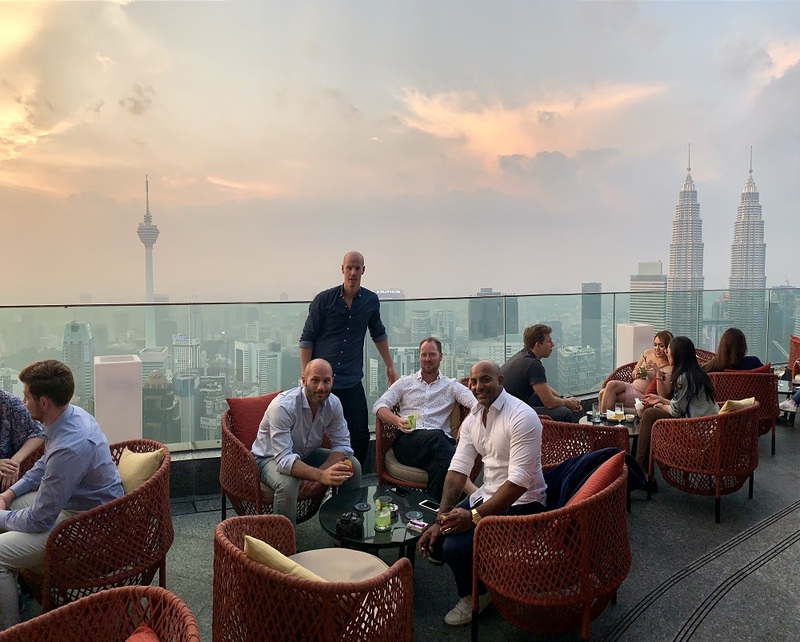 Sophisticated and stylish in vibe, the rooftop bar and restaurant serves Mediterranean and international cuisine along with a large variety of coktails and other drinks. 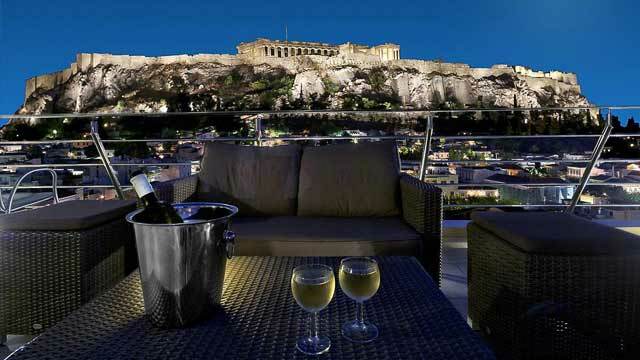 On the 10th floor of the modern Electra Metropolis you find one of the very best rooftop terraces Athens has to offer. Well equipped, to say the least, with the gourmet restaurant Metropolis Roof Garden, the stylish cocktail and rooftop bar M Bar, along with a beautiful rooftop pool. Add magical and unobstructed views of the Acropolis, and you see that this rooftop is really something special. Cosmopolitan in ambience, and usually buzzing with both local and foreign visitors. Perched on the 8th floor of the luxurious Hotel Grande Bretagne, this stylish and modern roof terrace offers one fine dining restaurant and two rooftop bars (one seasonal). 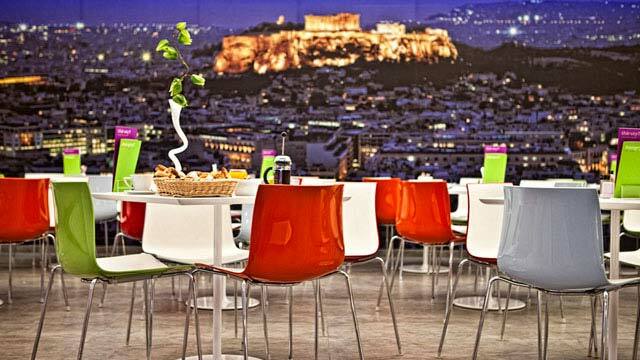 Located right by Syntagma Square in the heart of Athens, the views over Acropolis and the city center are fantastic. The GB Roof Garden Restaurant is one of the top ones in all of Athens, awarded several times and serving New Mediterranean cuisine, while the GB Rooftop Bar serves 50+ cocktails made to perfection. During summer you can also visit Bar 8, a completely open-air and very stylish cocktail bar. 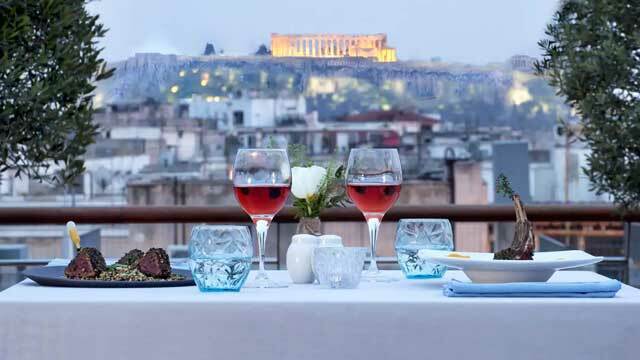 A nightly and seasonal open rooftop restaurant, located on top of the five star Divani Palace Acropolis, right at the new museum of Acropolis. 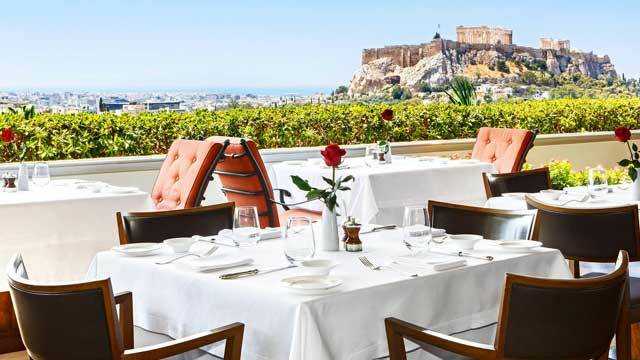 From the lush garden terrace you get stunning and uninterrupted view of the Acropolis. The 'secret' restaurant comes with a classic and cosy fine dining setting, and the terrace is a fantastic spot for a memorable and romantic dinner under the Athens sky. Enjoy friendly service and traditional Greek gastronomy with a modern touch, along with a fine selection of wines and well-made cocktails. 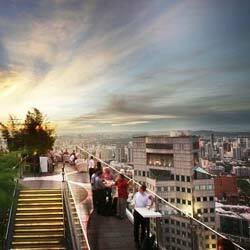 This cosy and friendly rooftop bar has an incredible view and a location that is just perfect. Perched on top of the cosy Plaka Hotel, right between Monastiraki and Syntagma Square, the actual bar is quite simple and small, but with a good selection of of various cocktails, wines and beer. Furnished with comfortable sofas and deck chairs, the rooftop bar is only open nightly, but the terrace is open all day for anyone to enjoy the sun and views of the Acropolis, the old city of Plaka, Monastiraki area and much more. Located in the trendy Metaxourgio area, the cool Novus City Hotel comes with a roof terrace called VIEWS Rooftop Bar & Pool. 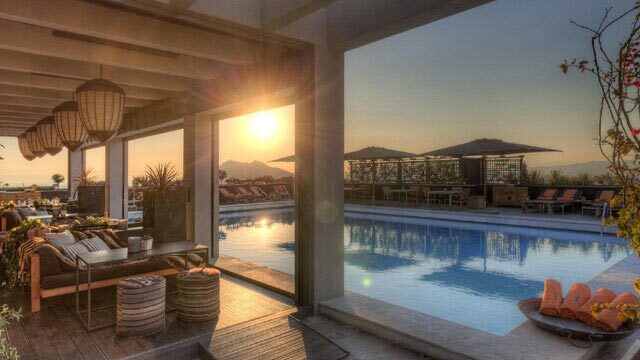 Located on the 8th floor it comes with an absolutely stunning 360-degree views across Athens and its surroundings. Colorful and modern, the terrace is quipped with a rooftop pool, lounge furnitures, olive trees, bean bags and deckchairs. Perfect for some sunny daytime relaxation or chill night time drinks taking in the lit-up Athens skyline. Discover the biggest collection of Athens activities, guided tours and skip-the-line tickets. Anything you want you'll find right here. There's a wide range of rooftops in Athens with magical roof terraces. 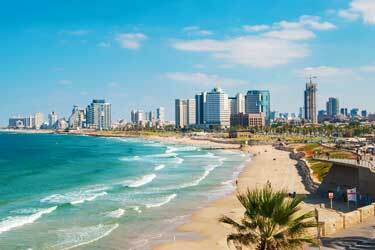 Most of them centrally located overlooking some of the city's cultural heritage. The warm climate makes Athens a perfect city to visit if you like places to drink woth a view. 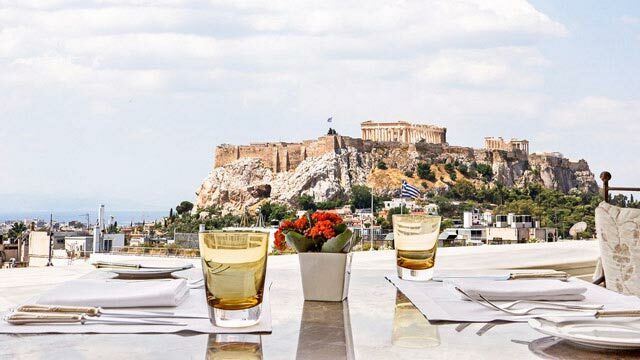 Most cocktail bars with a view in Athens are located around the Acropolis. Athens size, superb climate and great location means that the city has a lot of terraces to visit. With our site you will find the best that Athens has to offer. 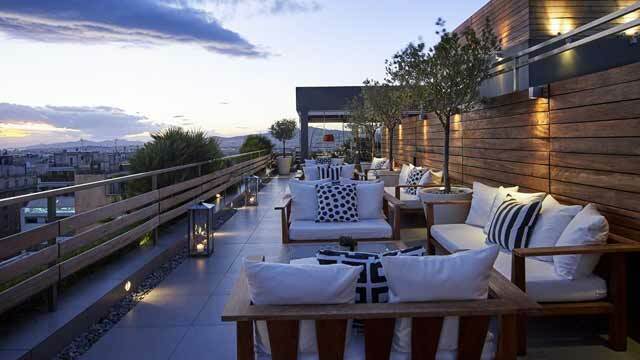 The roof terraces are often located at one of the hotels in the central parts of Athens. For being such a gigantic city, which Athens is, most of the Athens rooftop bars here are within walking distance of each other. Perfect for those who want to visit several roof terraces in Athens during one day. 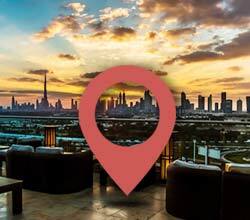 Find the sky lounges closest to your location by using our rooftop map over this city. Athens is Greece's largest city and also the capital with almost 40 % of the nation’s population. The most central part of Athens is Syntagma, Constitution Square, where, among other things, the Greek Parliament, Vouli ton Ellinon, is located. Syntagma Square is also one of the tourists' favorite destinations, because of the great amount of cultural monuments. The area also has several museums, the old town of Plaka and one of the world's most famous rocks Acropolis with the Parthenon on top. Greece (and Athens in particular) is very famous for its delicious native food. Olives, tomatoes, grilled food, feta, moussaka, tzatziki, souvlaki to name a few, are all very good ingredients and dishes you can enjoy at the rooftop bars in Athens. Regarding drinks, classic cocktails are very common, and also fine wines, cold beer and of course Greece's national drink - ouzo. The rooftop bars in Athens are more of peaceful character than wild party. It’s advisable to sit down and drink cocktails while enjoying the magnificent views you get from the roof terraces. Athens is not a high stack city in terms of houses and buildings. Despite this, there are several rooftop bars in Athens with a magical view. The views you get from the rooftops are great considering all the historical monuments the city has to offer. 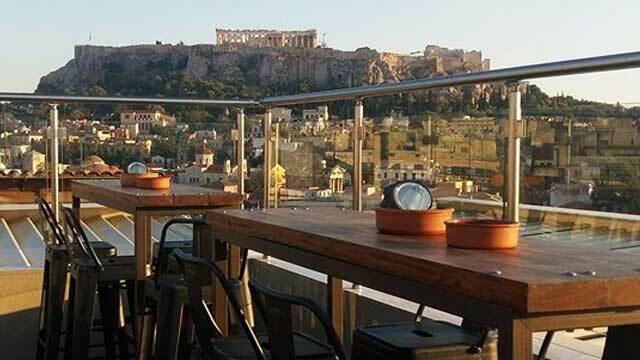 A common denominator for most rooftop bars in Athens is the view of the Acropolis. In the evenings, it is really impressive with the illuminated monuments that dominate the view of Athens. Athens is a city with many attractions. 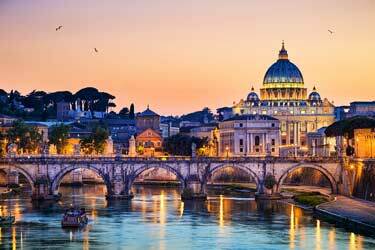 Historical buildings and monuments, beaches, shopping, etc. 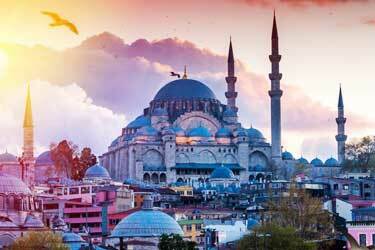 Foremost it is the Acropolis that one should visit. This historic site attracts hordes of tourists every year. For 12 euros you can walk around and experience everything Acropolis has to offer. Museum, guided tours etc. The Archaeological Museum is also a great alternative for those who like history. One of the best museums throughout the world in terms of antiquates. It is quite easy to get by plane to Athens. And the airport is fairly close to the center of Athens, making it fairly easy to get to and from the airport. The city abounds with hotels, many of them with really lovely terraces. 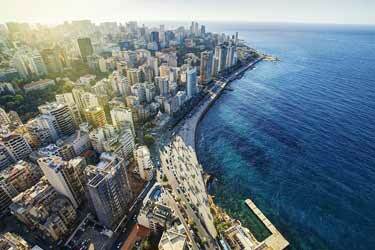 Most of the rooftop bars here are located at hotels equipped with good restaurants serving good Greek food. As expected, it is usually hotels with many stars that boast with fine rooftop bars overlooking Athens and the surrounding area. The climate makes Athens an attractive place to visit all year around.